THERE’S going to be lots of merry men in green tights roaming round Essex in a couple of weeks. 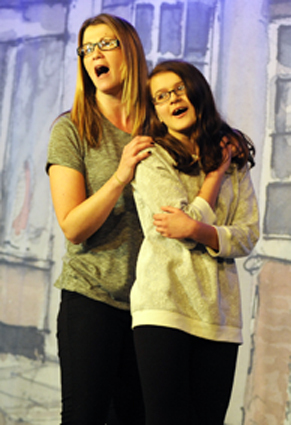 But no need to tell the Sheriff as Blackmore Players are getting ready for their pantomime, Robin Hood and the Babes in the Wood. The village, a few miles north of Brentwood, is noted for the excellence of its theatrical society and the ‘tights’ are essential as is the colour of green; historically Robin Hood would not be seen dead in anything else. This year the belly laughs will be with a panto written by Brian Herring, and directed by Craig Stevens and John Hughes. Robin Hood and the Babes in the Wood is more than just literation, it is a determined piece of imagination that would equal Snow White with three left feet. We all know the story. The evil tyrant puts up taxes to 95 per cent and imposes swingeing spending cuts while inflation roars out of control. Wages almost disappear and the evil Barons who supply wood and food are allowed to put up prices every week so the good folk are forced out onto the street to beg for food. Being very merry with more thigh slaps then mosquito bites in an Amazonian Rain Forest, the plot unravels with a rich selection of material, designed to get even the quietest child, standing on the chair and hysterically screaming warnings to actors with apparent hearing and motivation difficulties. Celebrating 50 years, the ‘Players’ enjoy a well deserved reputation for fine productions and being a friendly society with talent. 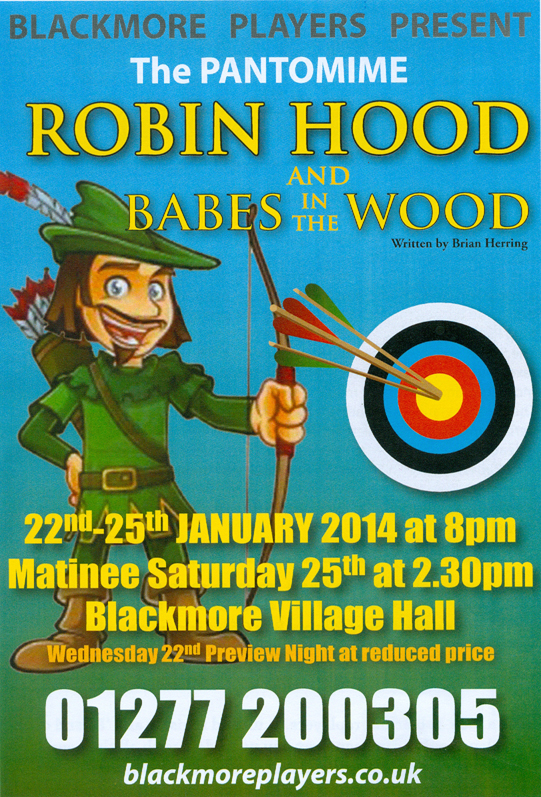 Robin Hood and the Babes in the Wood runs for five performances starting Wednesday January 22 to Saturday January 25, with a matinee performance, at the Blackmore Village Hall, Nine Ashes Road, Essex CM4 0QW.